In 2002, the New Zealand Government funded the Reference Group within the Ministry for Culture and Heritage to create a new Encyclopedia of New Zealand. Written and created specifically for the Web, this publication is being produced on-line progressively over a nine-year period: access to the Web site is free of charge. Te Ara – The Encyclopedia of New Zealand will contain approximately 2.5 million words, 25, 000 media objects and around 1,000 entries. ‘Te Ara’ in Maori means ‘the pathway’, and this Encyclopedia will offer many pathways to understanding New Zealand. It will eventually be a comprehensive guide to the country’s peoples, natural environment, history, culture, economy, institutions and society. Te Ara will be structured around nine themes, appearing progressively between 2005 and 2012. They include New Zealanders (published 2005), Earth Sea and Sky (published 2006), and seven others still to come. Photographs, sounds, moving images, documents, graphs and maps are combined with text in Te Ara. On average there is one media object for every 100 words. An important feature of the site is its Maori content. There are currently few reliable and accessible reference sources on Maori; the Maori history, culture, science and stories contained in Te Ara will be a significant contribution to an understanding of New Zealand. Te Ara combines short essays with a variety of multimedia additions in an exciting, entertaining and instructive way. Links provide pathways to the digital collections of libraries, archives and museums around the country, and the project has helped to encourage nationwide digitization of information. Te Ara also allows for the inclusion of community contributions such as photographs, oral histories, or updates of information. In 2003 the New Zealand Government granted funding for the development of a new Encyclopedia of New Zealand to be created within the Ministry for Culture and Heritage. The only previous comprehensive encyclopedia of the country had been produced in print form in 1966, and an update was deemed timely. Headed by New Zealand historian Jock Phillips, the project was immediately conceived as an on-line creation. 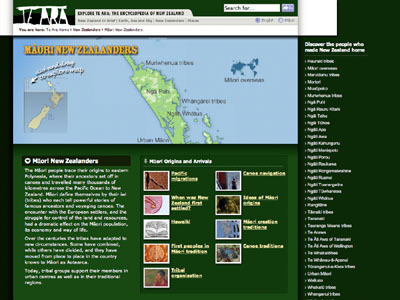 The precursors to this project were the successful on-line publication of New Zealand's Dictionary of New Zealand Biography (http://www.dnzb.govt.nz ) and another popular Ministry initiative, nzhistory.net (http://www.nzhistory.net.nz ). Te Ara – the Encyclopedia of New Zealand is the first national encyclopedia in the world to be developed especially for the Web. Te Ara means 'the pathway' in the Maori language, and the project is providing pathways to knowledge. The entries are being published on-line progressively, in thematic groupings, over a nine-year period. The possibilities of on-line publication have allowed Te Ara to develop as an exciting multi-media project, incorporating not only written text but photos, maps, sounds and video. Te Ara will be a gateway into the country’s cultural treasures – the images, sounds, objects, documents and films in regional repositories and private holdings, the special places of New Zealand and the people who forged New Zealand's identity. 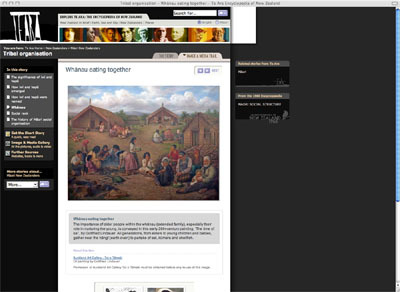 An important feature of Te Ara is its Maori content. The Maori perspective is presented with each theme, and entries with substantial Maori content are available in the Maori language. Some of the entries are being published, with illustrations, in print. It is envisaged that Te Ara will become the first port of call for reliable information about New Zealand: its land, environment, peoples, culture, history and identity. It is free to all users. After funding had been confirmed for the project, a small staff (including the General Editor, Production Manager, Managing Editor and Manager, Web Resources) spent a year designing the structure and content. Extensive use was made of reference based sites already on the Web (models such as the BBC and PBS, and numerous national and international library and museum sites were carefully examined). Focus groups and experts, both national and international, were consulted. By the end of this preparatory year, a sequence of themes and a model for an entry had been developed. This model was published and trialed on another Ministry site, http://www.nzhistory.net.nz/. In addition to this work, three advisory committees were established: a general committee, a Maori committee, and a repository committee. IT partners were enlisted after a thorough process of tender and proof of concept. Today these partners include Shift, Optimation, OneSquared, and the New Zealand Electronic Text Centre. A branding exercise was undertaken – the resulting choice received a national design award. Finally, entries for the first theme were commissioned and an in-house staff were appointed and trained. At the start of the project a decision was made to develop the publication thematically rather than following the traditional alphabetic encyclopedia model. This allows for the grouping of expertise and cross-disciplinary engagement. The cross-searchability of the Web adds value to this model, enabling users to connect seemingly disparate subjects in one theme to another through key search terms or phrases. New Zealanders – the people of New Zealand, and their origins (published 2005). This theme includes entries about the major iwi (tribes) of New Zealand and the settler communities who came later. It is the first comprehensive guide to the iwi of New Zealand to be published. Earth, Sea and Sky – the natural environment of New Zealand including climate, earthquakes and sea life (published 2006). The Bush – landforms, flora and fauna, including native birds, native plants and fungi and native animals (to be published September 2007). The Settled Landscape – how the New Zealand people live in, use and change their environment, including topics to do with agriculture and horticulture. Work has begun on this theme – an entry list has been created and the new theme editor appointed. Trade and Exchange – the economy, business and city life. Nation – systems of government and symbols of national identity. Daily Life – the customs, leisure activities and beliefs that make New Zealand unique. Creative Impulses – arts, culture, invention and innovation. Places – A guide to the regions within New Zealand including 22 regions from North Cape to the Bluff. Each of the entries consists of two parts: an overview covering each region’s geology, natural history, people, culture and history; and a complete gazetteer of the area including brief descriptions of the major localities and their natural features. This theme is being developed over the entire period of the project. Also included in the Web site is the Encyclopaedia of New Zealand (1966). This print encyclopedia was double-keyed in India and digitised with the assistance of the Electronic Text Centre at Victoria University of Wellington for publication on-line. It includes 600 line drawings, maps and graphs, and has been reformatted to fit Te Ara's structure. Although it is outdated, it is still a valuable reference work and was seen as the solution to providing as much comprehensive information about New Zealand as possible while Te Ara developed. Once the new project is complete the 1966 Encyclopaedia will offer an interesting time capsule, enabling users to click from current thought to the ideas and views held in 1966. To ensure that users know this should be considered an ‘historic’ resource, the design of the pages to reflects its origins. Another feature of the site is the Dictionary of New Zealand Biography which contains information about the lives of over 3,000 people who were active between 1769 and 1960. Although this is currently a separate Web site, it will soon be fully integrated into the Te Ara site. Each theme is divided into between two and ten sub-themes (broader topics) and approximately 100-110 entries (specific subjects). Depending on the subject these entries usually contain 1000 – 2000 words. The entries in turn are divided into sub-entries of around 500 words (a little larger than one computer screen) for ease of accessibility. Each sub-entry is accompanied by up to five captioned resources (photos, artworks, ephemera, original documents, maps, diagrams, sound files or moving images) intended to add value to the text or enable an author to expand on a point that could not be covered sufficiently within the word limit. Relevant annotated links are also supplied for the on-line Dictionary of New Zealand Biography. Each entry has a home page with a 'hero' image evocative of the content of the entry. A short blurb entices users into the entry and a link to a 'short story' for younger readers is available from this page. If an entry has considerable Maori content, an option is provided to read it in the Maori language. Community Contributions: What's My Story? Because we are keen to give the broader Te Ara community a voice, an appeal is made regularly to the New Zealand public to provide community contributions on various subjects related to the theme under development. The first of these appeals accompanied the theme about the people of New Zealand. Members of the public were asked to send in personal accounts about the ‘voyage out’ to New Zealand. A variety of contributions were received, from diary accounts of travel to New Zealand in the nineteenth century to recent memories of migration to New Zealand. The second theme included a number of entries about New Zealand’s natural hazards. An appeal for 'disaster' stories elicited contributions about tsunamis, earthquakes and floods – real experiences often accompanied by images of the events. Another appeal was made for contributions about beachcombing – unusual findings on New Zealand’s extensive coastline. Tales of encountering everything from a severed hand to a sea snake (New Zealand does not naturally have any snakes in its environment) were received. It is hoped that the latest appeal for stories about people’s experience in New Zealand’s great outdoors (entitled colloquially ‘Bush yarns’) will generate the same kind of interest and continue to add to the human dimension of the site. These contributions are sent in to Te Ara by the public in both digital and hard copy. A selection is made, edited to fit Te Ara house style, and published on-line. Te Ara is presently examining other possibilities for user interaction with the site. As a national encyclopedia, Te Ara’s task is to provide a variety of pathways to accommodate many different people with diverse needs and interests. It meets these requirements in a number of ways, as follows. Younger users and speakers of English as a second language: Every entry has a ‘short story’, a brief (200-300 words), accessible summary of the content written in lively, user-friendly language. This is targeted specifically at the elementary school-aged audience. Secondary school students and general New Zealand readers: The main entries are aimed at a 15-year-old reading level. Plain, everyday words are used. If technical terms are needed they are clearly explained in context. An exception is the use of names for flora and fauna: the scientific, Maori and common names are given. Maori audience: All entries with extensive Maori content are translated into te reo Maori (the Maori language). There are now a number of total immersion Maori language schools in New Zealand and Te Ara needs to ensure that it is of value to this sector. A button at the top of each page allows the user to switch from one language to the other. International audience: The Web allows Te Ara to reach a vast international audience, and as such it is an important tool for telling others about New Zealand and attracting foreign tourists. 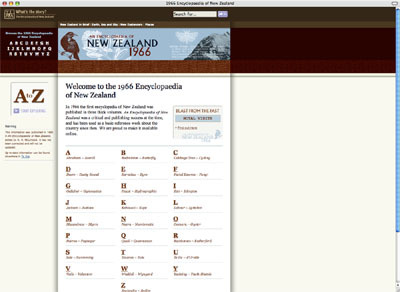 With this market in mind, a clickable glossary is provided so that users can understand New Zealand vocabulary - like Maori words in common New Zealand usage (e.g. 'Pakeha': a term used to describe a non-Maori person, usually of British ethnic origin or background) or colloquial expressions (e.g. bach – meaning a cottage or holiday home). Scholars: The Te Ara entry is designed to take users to the frontiers of received knowledge about a subject. Entries take account of recent research, discoveries and different perspectives. Where there has been scholarly debate on a topic or diverse interpretations of it, this is indicated, even if only briefly. Where direct quotations are used, a click brings up the full reference. At the end of each entry there are suggestions for further sources, and there is an annotated list of relevant Web sites to allow users to discover more. Some resources include primary material such as documents (as images or PDFs) or statistical material for users to explore if required. The visual non-reader: An image and media trail has been created to encourage reluctant readers or those who explore their world visually to interact with the site. By browsing from one media item to another, a user is able to obtain something of the sense of an entry. A list of entry subjects for each theme is prepared by the Theme Editor in consultation with the General Editor, Te Ara staff, interested groups and Te Ara advisory committees. The General Editor and Theme Editor then commission entries from internal and external writers. The General Editor and Theme Editor receive the entries, read them and if necessary return them to writers for amendment. A small team of writers within the Te Ara office of the Ministry for Culture and Heritage has created on average 40% of the encyclopedia text, depending on the theme being written. The remainder is written by experts out of house. The externally-written entries are checked and restructured into encyclopedia style by writers in-house. The Writing Team has a small core staff which is augmented by experts according to the theme being worked on. For the entries about the people of New Zealand, the team was predominantly New Zealand historians. When the themes about New Zealand's natural environment began, the team was changed and slightly expanded to include a geologist, botanist, zoologist and ornithologist. The appointments for the fourth theme are about to be made, and an expert on New Zealand agriculture has recently been employed to lead the team. Once an entry has been written and checked, it is allocated to a Resource Researcher to locate other media. Researchers need well developed research ability, a knowledge of research institutions, both within New Zealand and international, and excellent PR skills. The budget for resources is not large, but the possibilities for the inclusion of material are seemingly endless. It is a constant juggling act to make sure that the best material is included within the financial constraints of the project. To date approximately 9,000 resources have been gathered and optimized for publication. The final choice of material to be added to an entry is made at a meeting involving the Writer/Checker, Theme Editor, General Editor and Manager, Web Resources. After this meeting the Resource Researcher then locates and orders resources and prepares the caption document which is given to the Writer/Checker for the writing of captions. An SQL database is used to manage the chosen resources, their ordering, optimization and final publication on-line. While a distributed model for the collection and display of other media was considered in the early stages of the project, it soon became clear that collecting and optimizing digital copies of material in house was the most expedient solution. The SQL database records the provenance of all resources and manages the reference information, including links back to institutions, which appears below captions. Creating and maintaining links with potential suppliers of material is an important part of the Resource Team's work. An advisory committee that included managers of libraries and museums from around the country assisted with initial planning for the team. They recommended that personal contact was important in setting up lasting relationships. As a result, members of the team traveled around New Zealand – a Te Ara 'roadshow' – to spread the word about the developing project. The aim was to obtain buy-in from as many institutions and individuals as possible, with a view to obtaining the best resources available to enhance entries, as well as finding new material to add to the published scholarship. At the beginning of the project very few institutions within New Zealand were digitally aware – repositories in smaller centers often had no knowledge at all of the possibilities of the developing Web. With this in mind a portable digital kit was created – a small scanner and lap top computer – which could be taken by hand to smaller institutions in out-of-the-way locations. This not only enabled the project to publish new material but alsogave some smaller institutions an early presence on the Web. Te Ara, through these resources, now provides pathways to the hard copy and digital collections of museums and libraries around the country. The work Te Ara has undertaken so far has encouraged the process of digitization in New Zealand. The Alexander Turnbull Library – a national repository containing a significant collection of New Zealand photos, artworks, ephemera and manuscripts. Television New Zealand – New Zealand’s major television provider. Archives New Zealand – guardians of the history of New Zealand’s official institutions and also a significant historical film and photograph collection. GNS Science, Institute of Geological and Nuclear Sciences – New Zealand’s providers of earth science research and consultancy. Department of Conservation – the government organization charged with the protection of New Zealand’s natural and historic heritage. New Zealand Historic Places Trust – the leading agency for the protection of sites and buildings in New Zealand. Natural History New Zealand – a world-leading producer of factual television. A number of New Zealand’s other leading libraries, including Auckland City Libraries, Christchurch City Library, and the Hocken Library. New Zealand’s larger museums, including Te Papa Tongarewa – the Museum of New Zealand, Auckland War Memorial Museum and Canterbury Museum. Art galleries such as the Auckland City Art Gallery and Christchurch City Art Gallery. As with any publication project, the principles of permission, copyright and moral rights need to be carefully considered. Before any material is published on-line, a thorough check is made to ensure that all rights have been cleared. Te Ara has now appointed a dedicated Rights Administrator to manage other media rights. In addition, one member of the Resource Team has expertise in the Maori environment and is charged with ensuring that appropriate consultation is undertaken before any material specifically associated with an iwi (tribe) is used. Once the Resource Team has allocated resources to an entry, draft ideas for maps, graphs and diagrams are prepared and given to the Design Team. The project is fortunate to have talented young designers who are constantly working to develop new and creative ways to produce diagrams, maps, viewable imagery and primary material on-line. Macromedia Flash is used to create and deliver interactive maps, diagrams and viewers for zooming into larger images. This mechanism is also used to drive the audio-visual player designed for the site. Moving images are presented with high and low band width delivery options. Optimizing often poor quality images for best results on the Web. Thumbnailing each image individually to entice users to view the larger item. Visualizing the way historic material (e.g. hand written diaries, historic maps and the like) can be displayed to best effect in the Web environment. Enhancing the viewer experience of historic photos, allowing users to zoom in to portions of images that would otherwise be difficult to view in the limited real estate allowed by the Te Ara design. Creating new diagrams and maps using up-to-date research, enabling users to understand complex scientific concepts using the visual medium. While the resource and design work is underway, the entry (and accompanying captions) is passed to the Editing Team, who copyedit the entry and write a short story (for the younger audience) in consultation with the Writer/Checker. Design work for the entry is collated and finalized by the Web Designer. The text is then formatted and converted into XML by the Production Editor and uploaded to the staging server. The entry is returned to the external writer if appropriate (via a secure staging site) for comment, and an in-house review is also undertaken. Necessary amendments are made and the entry is finalized. The project has adopted open standards wherever possible to allow for future extensibility. Content is kept separate from presentation and source documents use XML mark-up. The presentation layers are based on HTML templates and Cascading Style Sheets (CSS). XML is used to manage the links between non-textual resources, their captions, reference information and text. XML also enables the management of links between entries. Matapihi (http://www.matapihi.govt.nz ), a National Digital Forum (New Zealand) initiative hosted by the National Library of New Zealand. Matapihi (window) is a portal into a number of cultural institutions around New Zealand. It presently provides links to the digital collections of ten New Zealand cultural organizations. Results of searches on the site are displayed as thumbnails which lead to a larger version of the item on the Web site of the contributing organization. 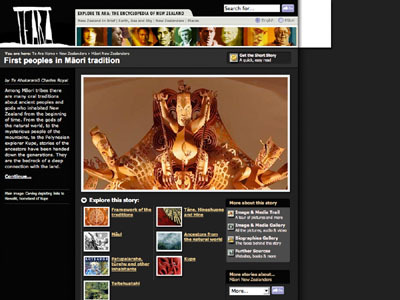 In the case of Te Ara, they lead to a link to the home page of an entry. How Has Te Ara Been Received? By the end of December 2006, the Te Ara site had received over 1.5 million unique visitors. 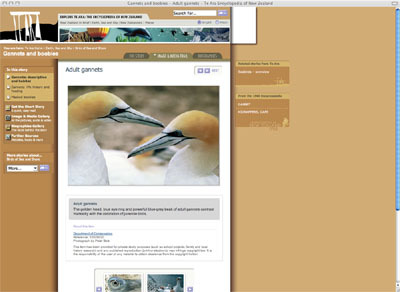 By the time the team returned from their summer break in January 2007, a total of 2.2 million visitors had viewed the site. Around 50% of users come from New Zealand, with ever-increasing numbers visiting from the United States. Of all international visitors, those accessing the site from the USA make up almost 70% of traffic. Australia and Great Britain (in that order) are the next most common countries of access. It appears that the site is reaching its target audience – traffic clearly dips during the New Zealand school holidays, and there is much evidence to suggest that the site is a favorite with the education community for teaching in the classroom and for homework research. Te Ara has been the recipient of a number of awards. TUANZ (e)-vision Awards 2005 – Te Ara and its designers, Shift, were finalists in the Education category. Best Design Award 2005 – Te Ara’s designers, Shift, were the winner of this award for interactive media and Web site design. GOVIS Buzzie Awards 2005 – At the GOVIS (Government Information System Managers' Forum) Conference in Wellington in May 2005, Te Ara received an award for innovation in the Technology and Society category. Te Ara is always looking at ways to improve communication with its audience and maintains a keen interest in Web 2 developments. Ideas for more community interaction, including possible wikis, blogs, and the like, are being discussed. There are also numerous possibilities for the use of Te Ara on mobile devices. User testing has continued throughout the project. The results of this testing have been carefully examined, and small changes to the site are presently being made. A feedback mailbox has also been maintained. The responses received provide potential corrigenda and ideas about the way the site might develop. Often users have spent some time considering the way this encyclopedia written for the Web works for them. In the immediate future the home page is being re-developed to accommodate the ever-increasing number of themes being developed. 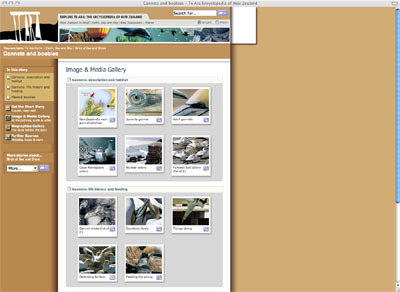 Alternative ways of displaying resources are being explored, as are small changes to the design of each entry home page. There are also plans for better access to and design of the short story written for younger readers. In the fast moving world of Web technology, the possibilities for the ongoing development of Te Ara are seemingly infinite. We are limited only by the constraints of time and budget. If you would like to know more, please do not hesitate to contact me: shirley.williams@mch.govt.nz.